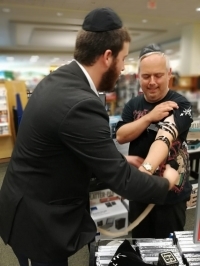 Roving Rabbi David Geisinsky assists a local Jewish man to don "tefillin," an age-old Jewish practice. 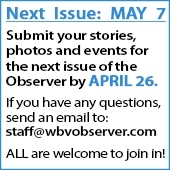 You've heard of roving reporters. Even roving fibers. But roving rabbis? A program initiated by the Lubavitcher Rebbe, Rabbi Menachem Schneerson, 70 years ago pairs up two young rabbinical students and sends them out to remote communities around the world. Their aim is to seek out the members of smaller Jewish communities; or for that matter, Jews in places where no Jewish community even exists. This summer, our community here in Westlake was fortunate to have been visited by two learned rabbinical students who gave up their summer break to offer Jewish teaching and inspiration to our locals. As the Jewish New Year approaches and Rosh Hashanah will be celebrated by Jewish communities around the world, Jews on the West Side are joining in as well! Inspirational services will be held at the Westlake Recreation Center on Sept. 10 and 11, as well as Yom Kippur at the DoubleTree hotel on Crocker Road in Westlake on Sept. 18 and 19. For additional information and full services schedule, visit jewishwestside.com.